Modern events with a historic twist. Celebrate your wedding or next special event surrounded by beautiful Art Deco architecture artfully blended with modern amenities. Right in the heart of downtown Dayton, The Grande Hall is filled with history and beauty that will inspire and delight both you and your guests. Opening in early Spring 2019, The Grande Hall will quickly become one of Dayton’s favorite venues for significant celebrations. With flexible floor plans, The Grande Hall can accommodate seated receptions for 300 guests to cocktail receptions up to 400 guests. Steeped in almost 100 years of Dayton history, The Grande Hall is recognized as a treasure by the National Register of Historic Places. With no shortage of beautiful and unique features, The Grande Hall provides numerous backdrops perfect for wedding photos. A new venue…almost 100 years in the making! It’s rare that a piece of forgotten history is rediscovered! You and your guests will delight in discovering craftsmanship and intricate Art Deco designs from a bygone era. From the gleaming marble floors to the stately handcrafted woodworking, and the soaring 30ft tall vaulted ceilings, The Grande Hall blends historic elegance with modern amenities. Get ready for your big day with two fully appointed luxurious Dressing Suites. Take photos in the original 1930’s bank vault or surprise your guests and have your bar in the vault. Move about the space freely with wide marble staircases or take the new elevator. Fully renovated restrooms on both the upper and main levels. Numerous easy parking options including valet service, paid garage parking or on-street parking is available. Tables and beautiful chairs for up to 300 guests are provided with your reservation. Several options for indoor on-site wedding ceremonies and cocktail hours are available. Hoping to be outdoors? We also have ceremony or cocktail space in the neighboring courtyard. Still have some planning questions? Visit our FAQs page or learn more about our Flexible Floor Plans. From the gleaming marble floors to the soaring 30ft tall ceilings, The Grande Hall inspires creative events! With a flexible floor plan and open sight lines, you and your guests can soak in all the ambiance and history this space has to offer. Whether you are planning a wedding, holiday party, corporate function or gala, The Grande Hall’s spacious open floor plan can be configured to meet any event needs. 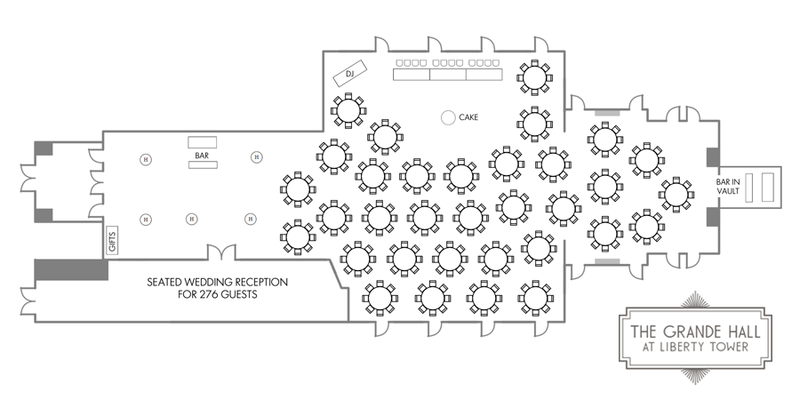 Customizable floor plans with seating up to 300 guests or 400 guests for a cocktail reception. All spaces within The Grande Hall are included with your rental: The Grande Hall, Mezzanine Level, Dressing Suites, Director’s Room and Bank Vault. The Bank Vault can be used for photos, bar space or photo booth location. Additional outdoor space is also available for ceremonies or cocktail hour in the neighboring courtyard. Numerous parking options from valet service, paid garage parking or street parking are available. Exquisite events deserve exquisite backdrops. The Grande Hall offers a multitude of picture perfect backdrops for your wedding photos. Our 16ft tall windows and easy street access provide beautiful available light photography options. Looking for something more dramatic? 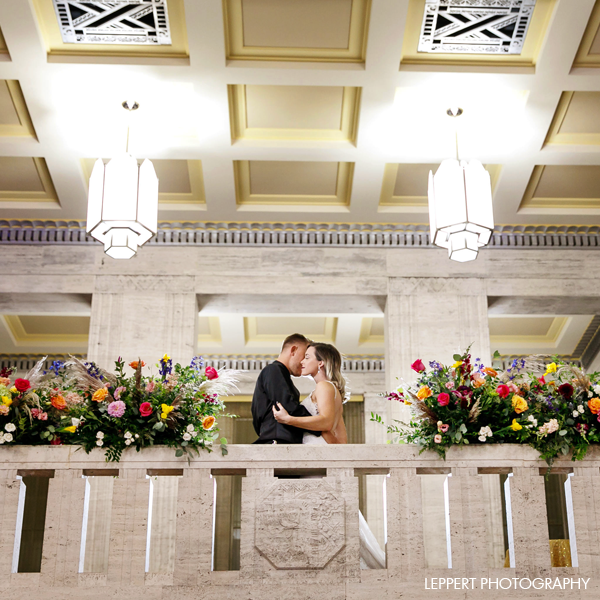 Our Mezzanine, Bank Vault, Director’s Room, and Art Deco architecture also make stunning photographic locations. Even our fully appointed dressing suites have been thoughtfully designed to make getting ready for your big day not only easy, but also another great photo op. Based on the true story of Forrest Tucker, a career criminal who escaped prison 18 times, The Grande Hall was transformed into a movie set for this highly regarded film. 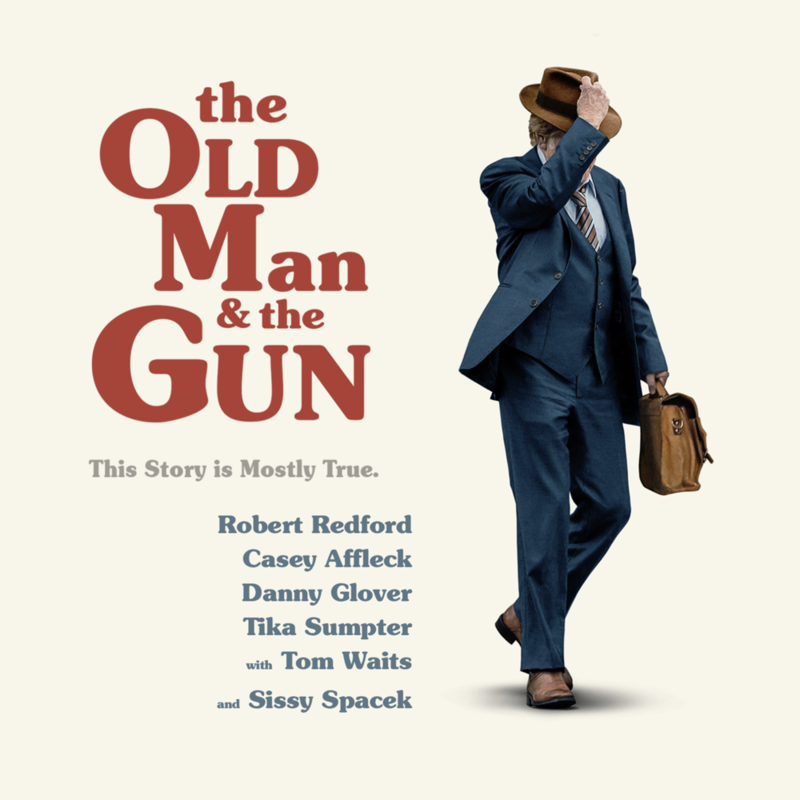 Staring Robert Redford, Casey Affleck, Danny Glover, Sissy Spacek, Tika Sumpter and Tom Waits, ‘The Old Man & The Gun’ filmed in our main hall, bank vault, balcony and all along West Second Street. Channel your inner movie star and feel the excitement of being part of Hollywood history when you’re ‘on set’ at The Grande Hall! Designed by the Dayton architectural firm of Schenck & Williams, who also designed Hawthorn Hill and The Engineers Club of Dayton, The Grande Hall was Dayton’s tallest building from 1931-1969. Iconic hotels and venues like the St. Regis New York or the Hotel Ritz in Paris are known for the invention of famous cocktails like the Bloody Mary and the Sidecar. Inspired by our rich history, The Grande Hall has also created a signature cocktail exclusively for our guests. During WWII, The Grande Hall’s roof was used as an air raid observation post with the code name ‘Dog Easy 77,’ which was the inspiration for our signature cocktail the ‘Dog Easy.’ Guests love the fun connection to Dayton History and you get to keep a copy of the recipe to take a little piece of The Grande Hall home with you. Learn more Liberty Tower history on ‘Our History’ page.